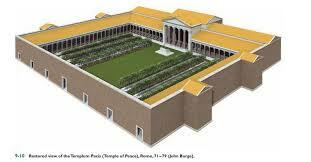 Rome’s archaeological authority will be restoring the Temple of Peace in the Roman Forum. The intentions for this are not limited to historical or archaeological interests but are about bringing attention to a reality so lacking in today’s world, that of Peace. Rome will show its historic commitment to peace by rebuilding sections of the Temple even as the threats of ISIS loom over the city. Ironically enough the Temple of Peace is a monument to Rome’s understanding of peace in a pre-Christian context and as such is based in a notion of peace not so unlike that of ISIS. The Temple of Peace was built by the emperor Vespasian in around 75 AD to celebrate the end of near constant war waged from the civil wars of 68 AD (that brought about his ascension as Rome’s first plebian emperor) to the Jewish Wars, which brought about his wealth and dominance in the eastern provinces. The peace celebrated in Vespasian’s temple was not about the mutual respect that comes with the belief that man is made in the image of God but it was about Roman victory that brought about subjugation and or elimination of Rome’s enemies. According to the ancient Roman & Jewish Historian Josephus, the siege of Jerusalem under the reign of Vespasian ended with over a million Jewish deaths and near 100,000 Jews enslaved and would come to its conclusion at the siege of the palace fortress of Masada in 74AD. This surely does not give one today the warm feelings and blissful thoughts we tend to associate with peace but it might bring a little insight into the mindset of ISIS type Islamists when hearing the reoccurring rhetoric about how they identify themselves as a religion of peace. ISIS and other like totalitarian political ideologies codify peace in terms of the hegemony of their system – subjugation of enemies. Peace in this context can not to be understood as the bliss one obtains in union with the Divine nor the serenity of one in union with humanity and the world. Peace is only a product of submission to the Roman Law or in the modern case Sharia Law. I look forward to the Temple’s restoration to be completed on Rome’s traditional birthday April 21st and hope it stands as a reminder to future generations to always be wary of the way the word Peace is used in the world and in history. Ever wonder where the World’s First Shopping Mall was? or the World’s First Central Heating System? or the World’s First Landfill Site? Well to find the answer to these questions and more, take a look at the fine inforgraphic that our friends at History.com have produced and marvel at Rome – The City of World Firsts. Check out the Guided Tours of Rome that Eternal City Education operate in support of the Eternal City Education Scholarship Fund to experience Rome and its wonders first hand. Everyone knows that you need to have money to make money. No large surprises therefore in learning that the richest people of the world are growing much richer, whereas the poor appear to be getting poorer in purchasing power. The printing of money by the Fed and Central Banks increases money supply but of course that doesn’t mean that everyday people get richer – it means the opposite – increased money supply equates to inflation – or a drop in value / purchasing power of the currency. In essence, the more currency that is printed, the less the currency is worth and so prices go up. This is a great way for governments and banks to reduce debt (known as inflating it away) but the effect on the everyday citizen can be harsh as prices for necessities increase. It is a way to steal wealth from citizens – a control of powerful over the weak. Of course when governments and central banks print huge sums of money in an attempt to stimulate economic growth, they assume that the money filters down the system to the everyday man on the street. Rarely this is the case in reality, with the richest in society accumulating the wealth. One of the effects of the current global economic situation is a reduction in the middle class who are pushed down into the working class. The powerful wealthy class grow wealthier / more powerful, and the weak working class increase – this stark financial inequality is of course the cause of revolutions and social upheaval – empires can fall as a result. The ruling empire of the day is arguably the American Empire…but how does it compare to the Roman Empire before it fell?? 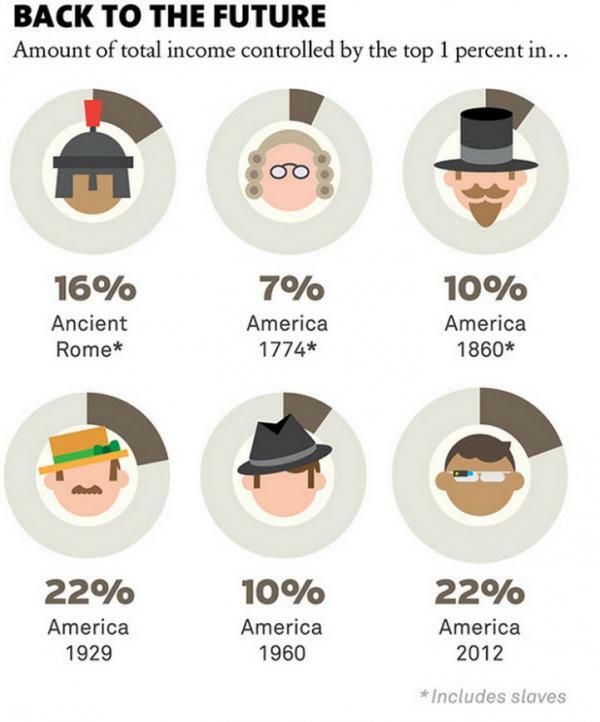 Well the infographic below shows that now, the US is 50% more unequal than Ancient Rome!!! In fact, the total income controlled by the Top 1% is drastically above that of the slave-included times of Ancient Rome and as high as the peak in the roaring 20s! Those who have read Egyptian Rome: The Obelisks are already aware of the links between Rome and the ancient Egyptian Empire. Perhaps the strangest of these however is the Pyramid located in Testaccio at the metro underground station on the B Line named…Piramide. 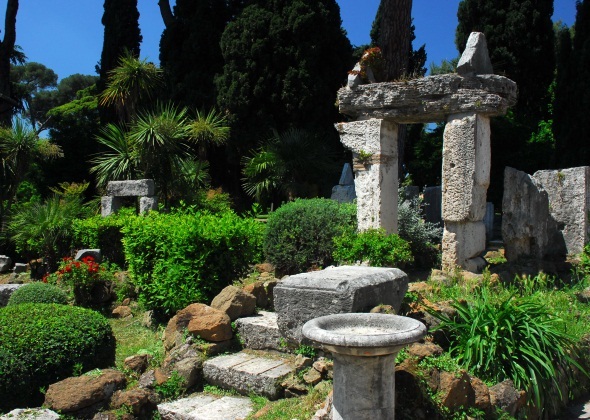 This beloved Roman monument, located next to the non-Catholic cemetery of Rome which serves as the last resting place of many of the English poets and artists to live in Rome, serves as a tomb to Cestia and dates from the first century BC. 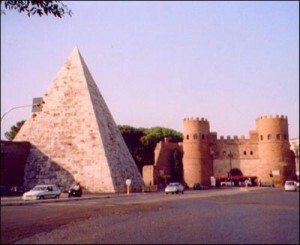 A Restoration of Piramide Cestia began in March 2013 but is now nearing completion. The 36-metre high monument was built as a tomb for the powerful Roman magistrate Caius Cestius. Experts believe that the structure has evaded collapse over the centuries because it was incorporated into the Aurelian walls in the years 271-275. However 2 million euro restoration of Piramide is being paid for by Japanese entrepreneur Yuzo Yagi who imports Italian clothes to his Yagi Tsusho chain of fashion stores in Japan. The restoration is due to be completed in the next few months and in July, Mr Yagi visited the site with Italian culture minister Dario Franceschini to see how work was progressing. The popular park of Villa Celimontana has undergone extensive restoration as part of the city’s plan to restore many of the Eternal City’s monuments and places of interest, and has recently reopened after being closed since April 2013. The Villa Celimontana restoration project was reported as costing close to a million euros and sought to reconstruct an ecologically focused park based on the 1926 original plans with the addition of extra foliage, benches, walls and four fountains. The park restoration has also included an automated irrigation system operational at night that uses rainwater collected into special tanks. The parks of Rome truly capture the atmosphere of culture and civilization that pervades Rome through its art, culture and architecture and visitors to Rome are strongly advised to make the most of these tranquil green areas. The most famous of these is Villa Borghese which includes a boating lake, multiple fountains and statuary, not to mention the Borghese Gallery which is a major tourist attraction of Rome in itself. Check out our guided tour page to learn more of this fabulous gallery at our Guided Tours of Rome page. Rome Is Pop – What To See In Rome! According to data compiled by leading hotel reservation company, Hotels.com, Rome was the most popular Italian city for foreign tourists in the first half of 2014, with Venice coming in second. Of course this is no great surprise given the beauty and history of the Eternal City. Wondering what to see in rome? Well, the Vatican City and the Coliseum were the two most visited tourist attractions with tourists voting the Basilica of St Peter to be the most impressive of the two – although it was a close run thing. 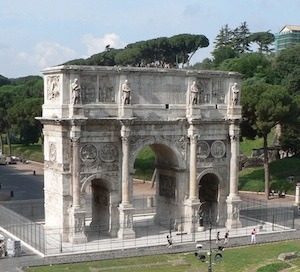 Why not book on one of Eternal City Educations guided city tours to see the best that Rome has to offer and in so doing, also skip the long lines and learn the fascinating stories and features of these awe inspiring places to see in Rome. 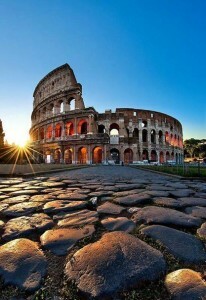 Simply visit our Rome Guided Tours page now before all of the places are booked up! Derived from the old Latin word for mouth (os), Ostia Antica is the ancient sea port of ancient Rome positioned at the mouth of the River Tiber. Perhaps founded as early as the 7th Century BC by Ancus Marius, the site boasts a wealth of important archaeological finds with some dating back to the 4th Century BC. On occasion sacked by pirates, as in 68BC, the port was later strengthened as the Roman Empire strengthened with the population growing to around 100,000 by the 3rd Century AD. However, just recently, in April 2014, experts from Britain and Italy have discovered that the port was more extensive and important than previously thought with some archaeologists insisting that it is more significant than Pompei. Using special equipment, the scientists have discovered the City Wall of Ostia built in the first century BC by Cicero and Clodius that sheds new light on how important Ostia was to trade in the first 200 years after Christ. A team from 14 universities was involved in this monumental find that includes large storage areas and warehouses on the banks of the river giving an indication of the volume of trade passing through Ostia and into Rome via the River Tiber. Discoveries are still being made with the most recent one in July 2014 consisting of a mausoleum for noble families including a child’s lead covered tomb containing curses of serious illness and grave death to any who desecrate the grave. Ancient hooks and lead weights nearby also give testimony of the areas fishing trade as well as a highly significant marble floor showing a mix of highly prized and imported marbles. 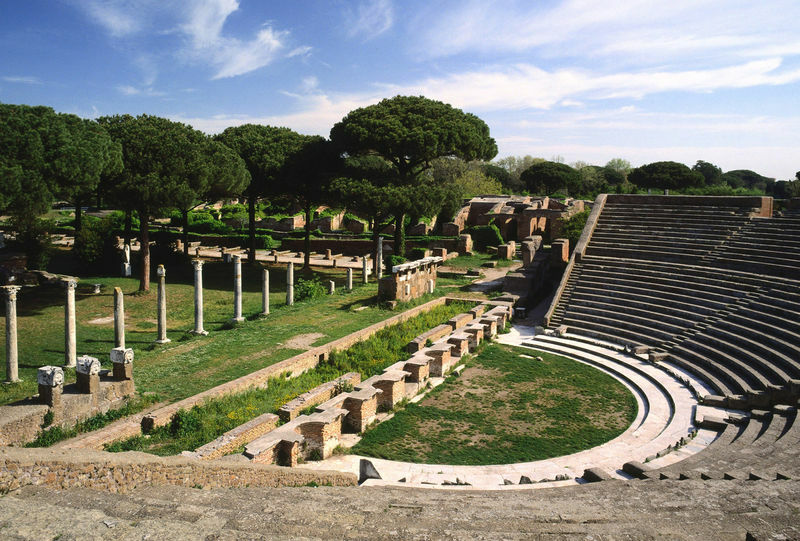 For those who wish to visit or know more about Ostia Antica, it is included in Eternal City Education’s educational study abroad programs in addition to private guided day tours. Visit our Study Abroad Courses page or Guided Tours page for more information. Arguably the greatest of the Roman Emperors, Emperor Constantine was the first amongst them who was baptised a Catholic. As was common among early adult converts to this underground religion, Constantine was baptised as late as possible due to the fact that on baptism all sins and temporal punishment for those sins are washed away. Constantine really gambled as it was on his deathbed that he was actually baptised. The date of the death of Emperor Constantine was today – 22nd May in 337 A.D. It was Constantine who legalised Christianity and the Catholic Church when he took power after his victory at the Battle of the Milvian Bridge. He attributed this victory to God as foretold by a dream he had in which he saw the symbol of the Cross as the key to the battle. This unprecedented shift in status of Christians from a persecuted minority to an in favour majority was truly remarkable. He is of course also the namesake of the great Byzantian city of Constantinople (now known as Istanbul). Constantine and his mother St Helena were responsible for many of the religious artifacts in Rome due to their efforts to collect them from their resting places and bring them to Rome. Examples include the wood of the Cross, the nails used in the crucifixion of Christ, thorns from the crown of thorns, and even the steps on which Christ was presented bleeding to Pontius Pilate – known as the Holy Steps (Santa Scala) to be found now opposite the papal basilica of St John Lateran. Constantine the Great had one of the greatest effects on history and the development of western civilization we know of. Studying Abroad Makes You Smarter!! So what are you waiting for – book your summer study program today and enjoy the experience of a lifetime – Education For Life.